On 2019 January 26, MAXI detected an X-ray increase from the constellation Scorpius. We first misidentified this source as EXO 1722-363 (ATel #12437). On Jan. 28 Swift/BAT detected it independently, and reported it as a new source Swift J1728.9-3613 (ATel #12436). It was followed up by Swift/XRT (ATel #12445) on Jan. 28 and NICER (ATel #12455) on Jan. 29. The spectrum and the quasi periodic oscillation indicate that it is a black hole binary. It reached a peak of 0.5 Crab on Feb. 2. 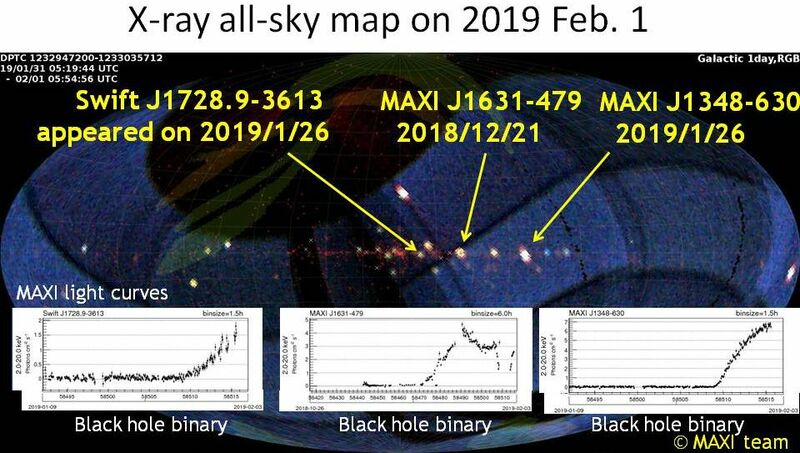 X-ray all-sky map on 2019 February 1. Three novae are shining brightly in the southern sky. All of them have turned out to be blackhole binaries. MAXI discovered an X-ray nova MAXI J1348-630 in the constellation Centaurus at 03:16 UT on 2019 January 26 (ATel #12425). Swift/XRT obtained the precise location (ATel #12434). There is a 16 magnitude star (ATel #12430) getting brighter ( ATel #12439, #12448). NICER observation suggests that it is a black hole binary (ATel #12447). MAXI J1348-630 has reached 1.5 Crab on January 30 (figure). Now it is the second brightest star in the X-ray sky. MAXI discovered a bright hard X-ray transient source at 04:33 UT on December 21, 2018 in the constellation Norma ( ATel #12320). The intensity was 209 +- 27 mCrab (4-10 keV). The Swift/BAT also detected it with flare-like behavior. There exists the 1309 second X-ray pulsar AX J1631.9-4752/IGR J16320-4751. But the MAXI intensity was about 10 times higher than the previous observations. The Nu-STAR X-ray telescope made a follow-up observation on Dec.28 ( ATel #12340). The MAXI star was 0.21 degrees away from AX J1631.9-4752 (figure), and was found to be a new star. The name is MAXI J1631-479. The X-ray spectrum taken with the Nu-STAR indicates that MAXI J1631-479 would be a black hole binary. Then it is the fifth new black hole found with MAXI in 2018. MAXI light curve of MAXI J1631-479. Taken from MAXI HP. It became very bright, more than 1 Crab. X-ray image taken with Nu-STAR X-ray telescope. White circle is the error circle which MAXI reported. AX J1631.9-4752 is in the error circle, but the new star is not AX J1631. MAXI J1631-479 is a new star. MAXI has detected another new faint source at (272.6, -19.6) since the end of November (see the figure in the previous news). Radio telescopes reported intense flares from the magnetar XTE J1810-197 on Dec 9 and 11 after 10 years of quiescence ( ATel #12284, #12285). Since the locations coincide, MAXI's source seems to be XTE J1810-197 ( ATel #12291). (MAXI light curve : XTE J1810-197). 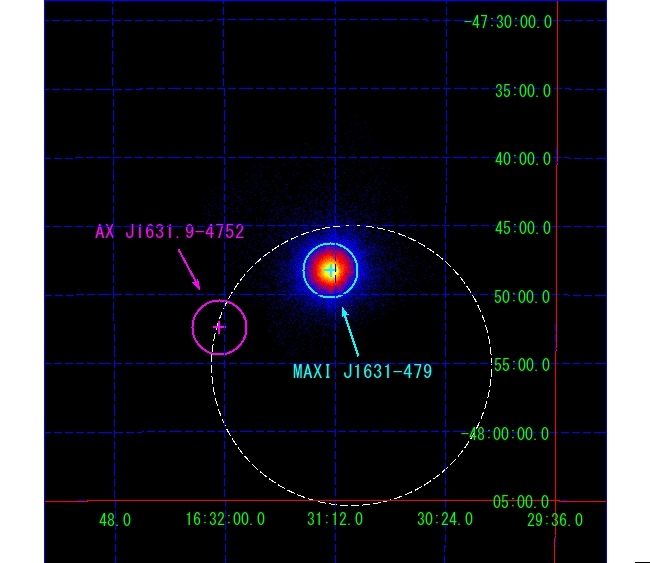 Nu-STAR TOO observations confirmed that this X-ray source is XTE J1810-197 indeed ( ATel #12297). It is a magnetar, which was discovered at the outburst in 2003. Magnetars are faint. XTE J1810-197 is the only magnetar whose emission is detected with MAXI. MAXI discovered a new source, MAXI J1810-222, on December 1, 2018 in constellation Sagittarius ( ATel #12254). This is a peculiar source which emits only soft X-ray below 4 keV. The 2-4 keV intensity was 20-40 mCrab (Figure). Looking back the MAXI data, the source appeared in the beginning of November. Such long-lasting soft X-ray source is unusual. It can be a neutron star binary in a low state, a bright blackhole binary at a far distance, or a new kind of X-ray source. Since the source locates close to the Sun with the separation of about 25 deg, X-ray followup observation is impossible with Swift and NICER. It is only possible with Nu-STAR, the hard X-ray telescope. Nu-STAR carried out 25 tiling observations on Dec. 9 and confirmed the existence of MAXI J1810-222 ( ATel #12283). The position is better determined with an accuracy of 2 arcminutes (=0.03 deg.) The spectrum is similar to that of the soft state of a black hole. MAXI 2-4 keV X-ray image of MAXI J1810-222 and aother new source. They appeared among 5 bright X-ray stars. 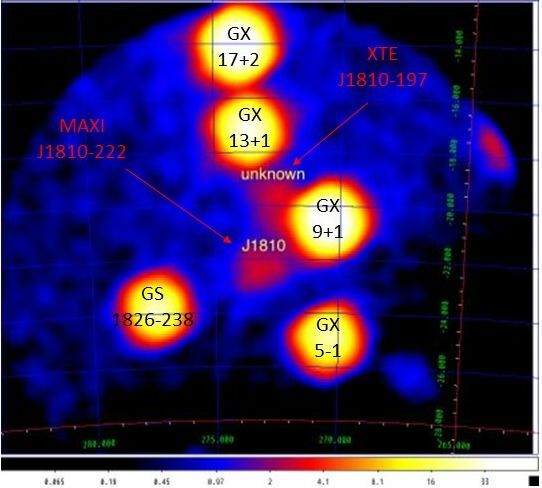 The new source (indicated "unknown" in the figure) was found to be a magnetar XTE J1810-197 (see the next news). 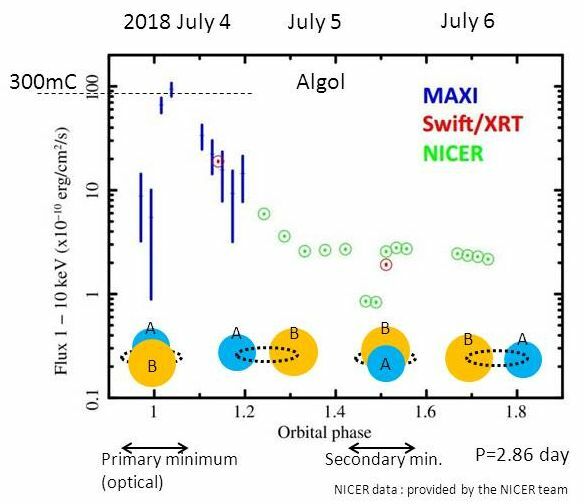 MAXI confirmed an X-ray emission (4 mCrab) from Swift J1858.6-0814 ( ATel #12163), which was discovered with Swift/BAT on 2018 October 25 ( ATel #12151). The source showed flaring variabilities as NICER detected an X-ray increase by a factor of a few hundred in 15 s ( ATel #12158). Such fast variability is very rare among X-ray binaries. 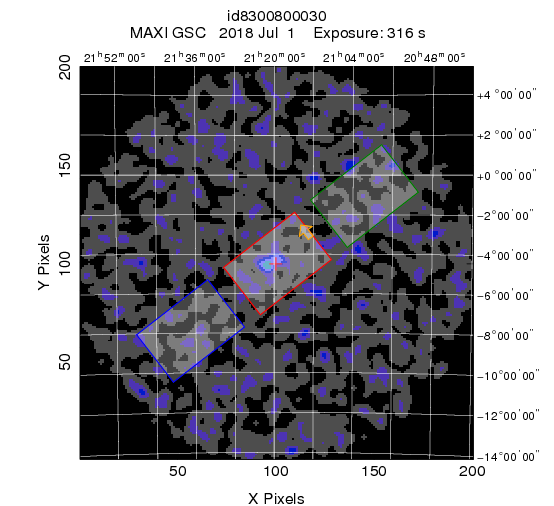 MAXI detected outbursts from the two Be X-ray binaries, A 0535+26 and GRO J1008-57 ( ATel #12092). They are binaries of a pulsar (neutron star) and a B-emission type star. Brightening of A 0535+26 was found on 2018 September 22, and that of GRO J1008-57 was on 2018 September 30. Their binary orbits are eccentric. The binary stars become the closest in every 111 days and 250 days (orbital period). Sometimes around the periastron, but not always, the stellar gas falls onto the pulsar and an X-ray outburst starts. The Be X-ray binary pulsar is one of the major categories in X-ray binaries. The black hole candidate MAXI J1820+070 showed a soft-to-hard spectral transition on September 22 ( ATel #12057). The soft state, whose emission is from the standard accretion disk, lasted from 2018 July 1 (58300 MJD) to September 22 (58383 MJD). (MAXI homepage : MAXI J1820+070. 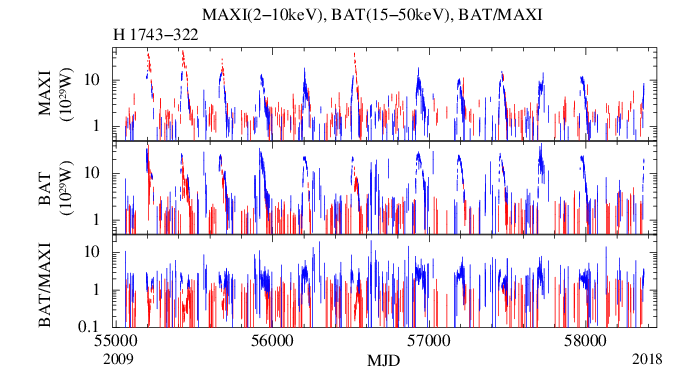 MAXI-BAT light curve). Light curves of MAXI J1820+070 with MAXI and Swift/BAT, and their intensity ratio. The blackhole binary, H 1743-322, in Scorpio is brightening. It reached 100 mCrab on September 18 with MAXI. This outburst was found by the INTEGRAL observatory (ESA) on September 3, 2018 at 40 mCrab ( ATel #12007). It was a 408 day after the previous outburst, and actually the 12th outburst detected by MAXI in 9 years (Figure). H 1743-322 repeats outbursts in 200 - 400 days due to the accretion-disk instability. MAXI (X-ray) and Swift/BAT (gamma-ray) have been watching the activity. Repeated outbursts from H 1743-322 in 9 years with MAXI and Swift/BAT. The bottom is the BAT/MAXI intensity ratio. A distance of 34,000 light-year is assumed. MAXI detected two stellar flares this week. One is from FT Psc at 14:31 UT on September 1, 2018 ( ATel #12016). The instensity was 160 mCrab. This detection was the second one following that on May 1, 2017. FT Psc is a 10-magnitude small star of spectral type dMe at 38 light-year, but is very active in X-ray. Another flare was from CF Tuc at 07:24 UT on September 3 2018 ( ATel #12009). The intensity was 150 mCrab. This is the second detection with MAXI following that on January 30, 2012 ( ATel #3897). It is a RS CVn type binary at 290 light-year, which is a star-pair with a very high X-ray activity. MAXI detected a Gamma-ray burst GRB180809A on 2018 August 9 11:38:25 in the constellation Sagittarius ( GCN #23103 ). The intensity was 2 Crab. Calet/GBM, which is mounted on ISS, also detected it (GCN#23117) as well as Fermi/GBM (GCN#23118). Since both are non-imaging detector, MAXI was the only one that could localize the position. 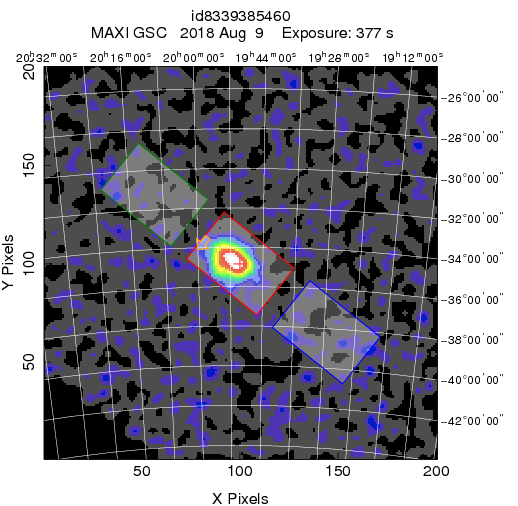 Being informed by MAXI, after 4-6 hours, the X-ray telescope Swift/XRT searched the MAXI error circle by 7 tiling and found an X-ray afterglow of 1.5 mCrab (GCN#23106). It had decayed out below 0.01 mCrab on 5 days later (GCN#23141). An optical telescope searched the region after 73 minutes from the MAXI detection, but there was no new star brighter than 20 magnitude (GCN#23107). There is no known galaxy at the position. The GRB180809A must have exploded in a very distant galaxy. MAXI image of GRB180809A at detection. 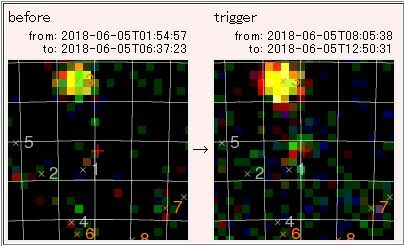 MAXI detected Cir X-1, which flared up suddenly from under detection level (<30mCrab) to 250 mCrab on 2018 July 12 16:53 UT. In the next two scans (90 and 180 minutes later) it stayed at 50 mCrab, and then it flared up again to 150 and 300 mCrab in the following two scans. ( MAXI alert page of Cir X-1 ). The spectrum was shaped as a blackbody of 1.2 keV ( = 10 million degree K). Cir X-1 is a peculiar binary consisting of a neutron star with weak magnetic fields and a Be star. In 2013 a supernova remnant was found around it and the age is estimated to be younger than 4600 years (Heinz et.al (2013) ApJ 779 171). The flares occur near periastron of the 16.6 day orbit, but not always. The last flare was 130 days ago. The flare lasts only for some hours to a few days. Violent behavior of the X-ray emission still remains ununderstandable. MAXI X-ray light curve of Cir X-1, which started to flare up on July 12. MAXI detected a large X-ray flare from Algol at 2018-07-04 05:52 (UT) ( ATel #11812). The flux was 300 mCrab. It was the largest among 14 flares which MAXI observed from Algol in 8 years. Distance to Algol is 90 light-years. Then the X-ray luminosity was 7 x 10^25 W, which is 1/6 of the optical energy of the sun ! Algol is an eclipsing variable star. The orbiting period is 2.86 day. MAXI team predicted an eclipse (in X-ray ! ) of this flare. MAXI's alert was followed by NICER, and NICER successfully detected the flare and the eclipse (Figure). From these observations, location and evolution of the huge X-ray flare will be analyzed. The overall view of the "Demon" star will be revealed. X-ray light curve of Algol which flared up on July 4, 2018. MAXI detection was followed by NICER observations. At 06:47 UT on July 1, 2018, MAXI detected a gamma-ray burst GRB180701A ( GCN #22880) in constellation Aquarius. The intensity was 74 +- 19 mCrab, and it shone only for 10 s. It was so weak that the nova search program did not find it. Instead, a graduate student found it. Although GRB occurs one in every day, it is rather rare that it occurs in the MAXI field of view (2% of all-sky). This event was the second GRB for MAXI in 2018. X-ray image of GRB 170701A at detection. Taken from MAXI alert page of GRB 180701A. On June 19 2018 MAXI detected a sudden X-ray increase from the neutron-star low-mass X-ray binary 4U 1608-52 in constellation Norma. The star is usually under MAXI detection (quiescence) and occurs an outburst intermittently about every year. It is because the accretion disk around the neutron star is unstable for this mass accretion rate. Spectral ratio (HR = Swift/BAT counts / MAXI/GSC counts) is an indicator of a spectral state (Figure). On June 20, 4U 1608-52 made a spectral state transition from hard to soft state as HR went down below 0.2. On June 22, it reached 700 mCrab and is staying in an almost flat level since then. Rise of an outburst of NS-LMXB 4U 1608-52. Taken from Spectral hardness monitor with MAXI and BAT. 4U 1608-52 is listed by the name of H 1608-522. MAXI J1727-203 was discovered by MAXI in constellation Ophiuchus at 9:41 UT on June 5, 2018 ( ATel #11683). In response to the MAXI's ATel, NICER on ISS tuened the X-ray telescope and confirmed the new source at 15:40 UT ( ATel #11689). The intensity is 150 mCrab now (June 6, 3h UT) and increasing. The spectral transition which was observed by MAXI, and the spectrum taken with NICER both indicate the source is likely a blackhole binary ( ATel #11696). MAXI J1727-203 appeared at a blank position (red cross). No.3 source is a bright LMXB GX 9+9. No.7 is a weak X-ray source Ophiuchus cluster of galaxies. No.1 is Kepler's SNR which is too soft to be deteced by MAXI/GSC. MAXI detected an X-ray brightening from SAX J1712.6-3739 on May 8, 2018 ( ATel #11636). The source is in the constellation Scorpio, and was discovered in 1999 by the Italian X-ray satellite BeppoSAX. The distance is 23,000 lt-years and almost as far as the Galactic center. The source is known to be a close binary of a neutron star and a low-mass star because it sometimes exhibits an X-ray burst. It is a thermo-nuclear-fusion runaway on the surface of a neutron star. The burst lasts for 10-100 seconds. Meantime, about 10^19 kg of H and He burns, and emits X-ray with 100,000 times more energy per second than the light from the Sun per second. Surprising on May-8 burst was that it had already started 8 minutes ago, as detected by Swift/BAT ( ATel #11623). It turns out a "super burst", which is a rare phenomenon known to us only recently since around 2000. It lasts for some hours, and emits 100 times more energy than a regular X-ray burst. Only about 16 superburst-sources are known. The X-ray nova with a blackhole, MAXI J1535-571, decayed under MAXI detection last week (2018 April 16, MJD 58224). ( ATel #11568). It appeared on September 2, 2017 It reached 5 Crab on September 19 and shone as the brightest X-ray nova in the 21st century. 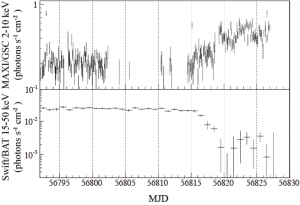 MAXI had monitored the X-ray flux for 7 months after the discovery ( MAXI light curve of MAXI J1535-571). It started to decay more rapidly around March 26, 2018 when the flux went down to 1 % of the peak. Then the peak in late September is supposed to be the Eddington luminosity. The distance can be calculated about 30000 light years. MAXI operation has been extended for another 3 years (2018.4 - 2021.3.) by JAXA. MAXI will find more and more X-ray novas. A distance of 11 kpc was assumed for flux-luminosity conversion. MAXI detected a postive flux (37 mCrab) from the gamma-ray source IGR J17379-3747 on March 19 2018 ( ATel #11447). This source was discovered at the outburst in 2004 by the INTEGRAL satellite. The system was turned out to be a binary of a neutron star and a low-mass star. It had an outburst again in 2008, when Swift/XRT determined the accurate position ( ATel #1714). At the MAXI detection of the 3rd outburst this time, VLA radio observatory poionted the position and detected a radio flux on March 22 ( ATel #11487). It means that a compact jet was emitted just like a ms pulsar. Follow-up observation by NICER on ISS which has a good timing capability in fact detected an X-ray pulsation of 2.1 ms (468 rotations per second !) on March 29 ( ATel #11507). NICER also measured the orbital period, which is only 1.88 hours, and then the companion star weighs only 0.06 solar mass (or somewhat heavier). Thus MAXI's detection triggers many observations, which in cooperation reveal a secret of the nature. The X-ray nova MAXI J1820+070 is now the second brightest star in the X-ray sky. MAXI J1820+070 was discovered by the Japanese payload MAXI on ISS on March 11 2018 ( ATel #11399). J1820+070 means the location (alpha, delta) = (18h 20m, +7.0deg) in J2000 coordinate. It is in Ophiuchus. 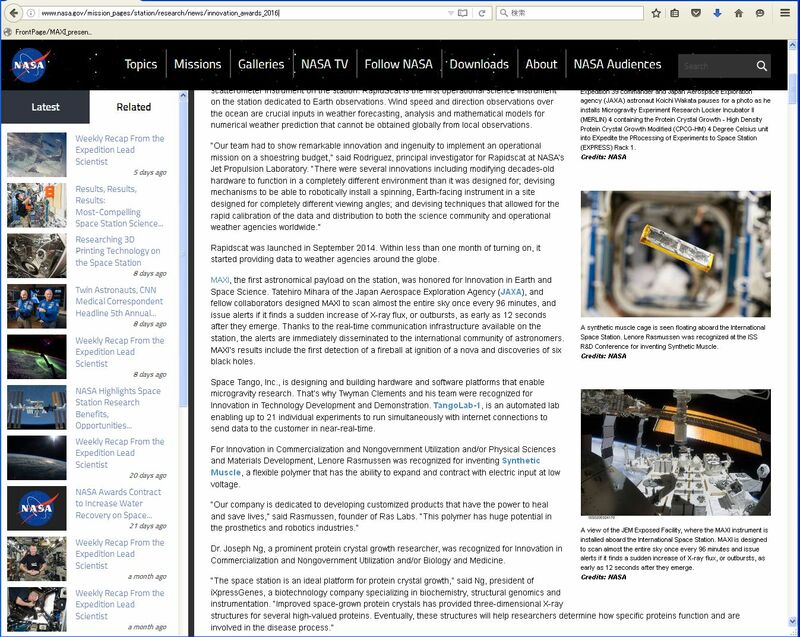 MAXI is monitoring the flux in every ISS orbit (~90minutes). At first it was only 30 mCrab. It gradually brightened up and reached 2 Crab on March 21. Since then in this week, it has stayed in almost the same brightness till today (March 27). Many follow up observations are carried out by Swift, NICER on ISS (USA), XMM-Newton, Integral (ESA), HXMT (China), as well as many optical and radio observatories. It is revealed to be a binary of a blackhole and a normal star. Crab is the unit of X-ray flux. 1 Crab is the flux from the Crab nebula. MAXI J1820+070 on 2018 3 23. MAXI/GSC detected X-ray birghtening from the Be/X-ray binary pulsar GRO J1008-57 from 2018 January 23 (MJD 58141) ( ATel #11244 ). The onset of this outburst occurred at the orbital phase of 0.90, using the the orbital parameters, T0=54416.65 (MJD) and Porb=249.48 d (Kühnel et al. 2013). 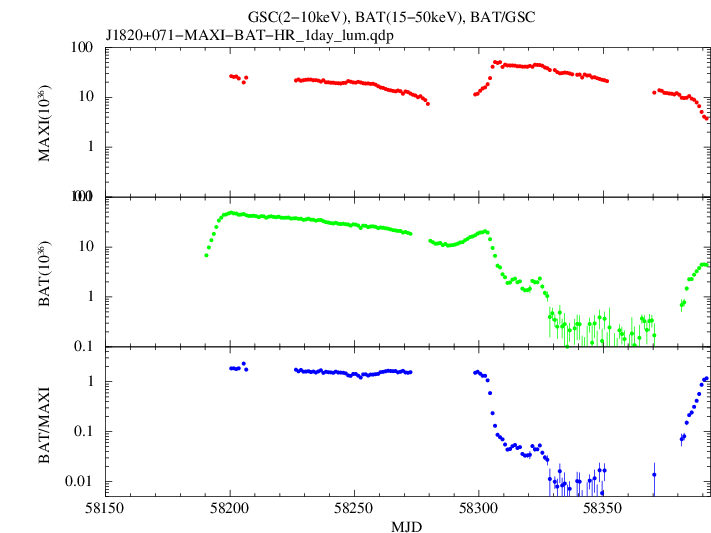 In 2009-2015 season, MAXI/GSC observations showed that the onset phase of the normal outbursts was in a narrow range (0.92-0.93) in orbital phase. However, the last 4 normal outbursts started from the orbital phase of 0.91. The shift of the outburst onset might imply that the geometrical parameters of the circumstellar disc around the Be star have changed. Folded light curves of outbursts in GRO J1008-57. MAXI discovered the X-ray nova MAXI J1535-571 in constellation Norma at 2017 September 2nd 23:55 UT (57998 MJD) ( ATel #10699 ). In 4 hour prior to it (20:00 UT) Swift/BAT discovered it independently ( GCN #21788 ). More 5 hours prior to it (14:41 UT) MAXI nova-search program had detected it automatically. Further observation with MAXI revealed that it is a black hole binary ( ATel #10708 ). The brightness of MAXI J1535-571 kept rising and finally reached 5 Crab on September 19th (58015 MJD). 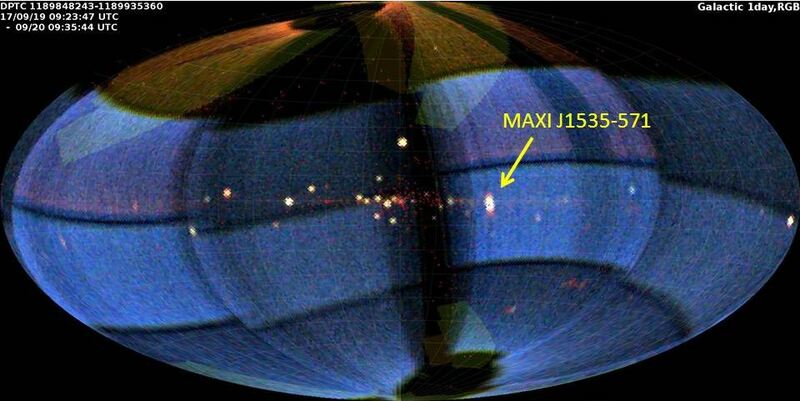 It has become the brightest X-ray nova ever in MAXI history. Appearance of an X-ray nova brighter than 3 Crab was for the first time in 18 years since 1999. In other words, MAXI J1535-571 is the brightest X-ray nova in this century. In fact, it is the seventh brightest blackhole X-ray nova in history [ Top list of Blackhole nova] ）. It is just three months ahead ! We call for contributed talks/posters. The deadline of registration is 30 September 2016. 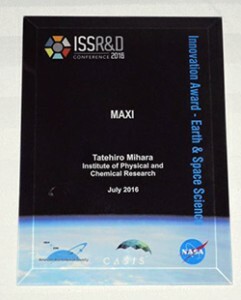 On July14, 2016, MAXI instrument was awarded for “Innovation in Earth and Space Science” in the “2016 ISS Research and Development conference” held in San Diego, USA. 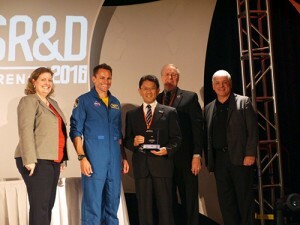 Organizers of the conference, which are American Astronautical Society (AAS), NASA and CASIS, select a top research in each of seven categories in the ISS R&D every year. Award ceremony. Center is Tatehiro Mihara on behalf of the MAXI team. MAXI has been observing the X-ray sky for seven years since August, 2009. MAXI team issued 350 Astronomer’s telegrams noticing variability in the X-ray celestial bodies to the world-wide astronomers. MAXI data is open from MAXI homepage in Riken, which contains light curves and spectra of blackhole binaries and X-ray binary pulsars, etc. They are used in more than 150 refereed papers in the high energy astronomy. In February, 2016, the first detection of gravitational wave (GW) was reported by LIGO team. MAXI scanned the GW source region in 4 – 30 minutes after the event and obtained an upper limits for an X-ray emission. Next GW event may occur in the field of view of MAXI. Combination of MAXI with new instruments will make MAXI more valuable. They are CALET (high energy electron and gamma-ray detector) on JEM and NICER (X-ray telescope on ISS coming up in early 2017). In the last four years, the Be/X-ray binary EXO 2030+375 has displayed an unusual behaviour: its X-ray activity decreased and type I outbursts were not detected at several periastron passages. At the same time, its pulse-period derivative changed from a constant spin up to almost zero (ATEL #8835). Optical observations revealed a large equivalent width of the H alpha line (ATEL #8927). 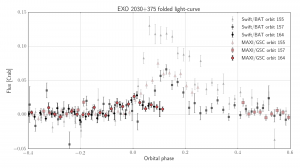 We report a shift of the outburst peak phase in the most recent (MJD 57589) type I X-ray outburst of EXO 2030+375. The peak flux of the latest outburst was ~30 mCrab on 2016 July 20 (MJD 57589) for both MAXI/GSC and Swift/BAT. This corresponds to an orbital phase of 0.015 (orbital ephemeris of Wilson et al. 2008) and represents a significant change from the almost constant value of ~0.13 for all the detected type I outbursts since 2007. The peak time changed from ~5 days after the periastron to ~0.7 days after the periastron. In addition, the latest Fermi/GBM spin frequency measurement (2016 April 25) suggests that the source is now starting to spin down. All these observations are strikingly similar to the events which occurred from January 1994 to October 1995. The X-ray flux decreased, leading to several undetected outbursts, followed by a slow transition to spin down. In October 1995, a sudden shift of the outburst peak time from ~5 days after the periastron to ~5 days before the periastron was observed (Wilson et al. 2002). 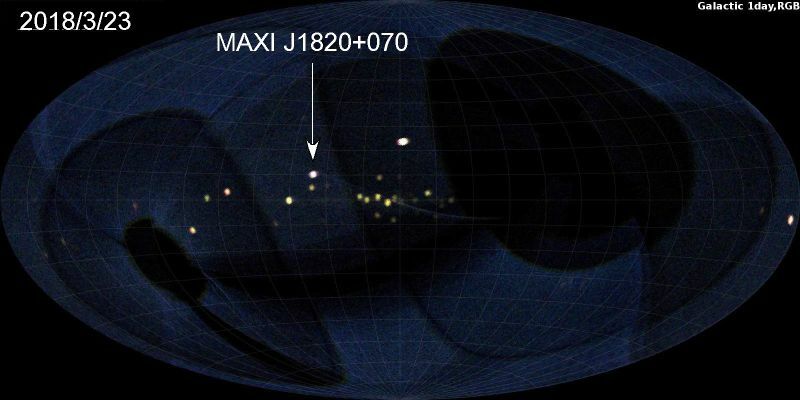 The first giant outburst was detected on MJD 46204 (1985 May). The peak could be 0-30 days earlier than this date. The orbital phase shift occurred at MJD 50040 (1995 October). The time between these events is of 3836 ~ 3866 days. The peak of the second giant outburst was around MJD 53960 (2006 May), which is 3920 days after the phase shift. The time between the second giant outburst and the current phase shift is of 3629 days. All these time spans are similar. We strongly encourage optical and infra-red observations to better understand the origin of this apparently recurrent events. The recent outburst compared to the last two brightest outbursts is shown below. Recent type I outburst of EXO 2030+375 compared to the last two brightest outbursts. Orbit 1 is MJD 50086.967, which is the first periastron passage after the launch of RXTE. The current orbit is 164. 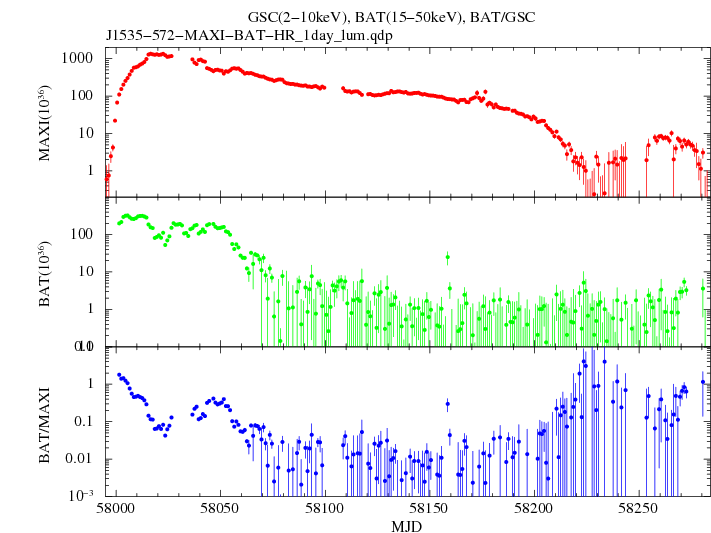 The latest evolution of the outburst can be followed at the BeXRB monitor page: http://integral.esac.esa.int/bexrbmonitor/ which combines data from MAXI/GSC, Swift/BAT and Fermi/GBM. This news has been posted to ATEL #9263. On 2016 January 24 (MJD 57411), the MAXI/GSC nova-search system detected an X-ray emission from the recurrent Be/X-ray transient pulsar, GX 304-1 (ATel #8592). The Swift/BAT also observed the brightening from January 23. 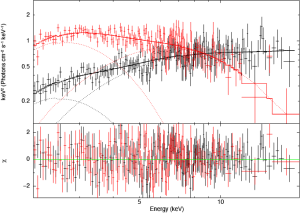 The MAXI trigger time corresponds to the orbital phase of 0.019 (adopting Porb=132.189 d and To=55425.6 (MJD) ; Sugizaki et al. 2015). Thus the present event is a normal outburst. Comparing it with the recent four normal outbursts, we found that their onsets steadily shifted later and later (from ~0.90 orbital phase on 2014 December to 0.02 on 2016 January). Such a shift has been observed from three other Be X-ray binaries (GS 0834-430 ; Wilson et al. 1997, EXO 2030+375 ; Wilson et al. 2002, A0535+26 ; Nakajima et al. 2014). Although not all of the Be X-ray binaries show the shift, the shift of the outburst phase might be a common phenomenon in the Be X-ray binaries and it might be based on some physical mechanism. 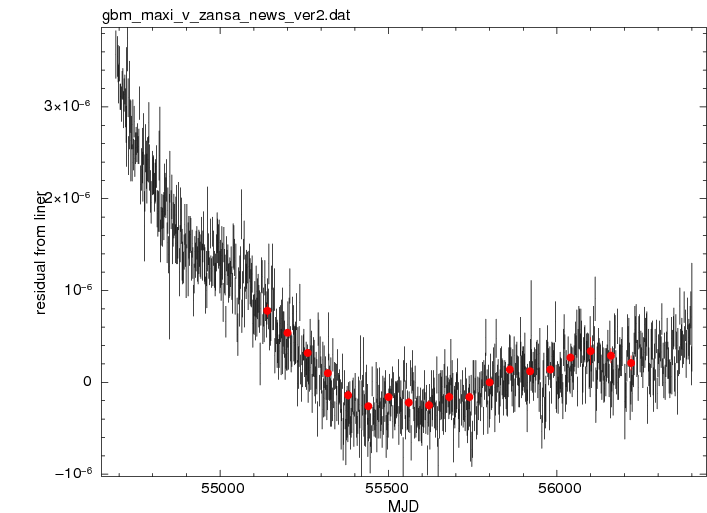 The MAXI 2-20keV light curves of the recent 6 orbits of GX 304-1 from the top to the bottom. The horizontal axis is the orbital phase. 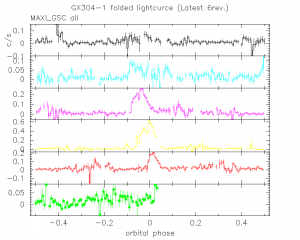 A steady shift of the onset phase is seen in the succeeding 4 outbursts. The neutron-star low-mass X-ray binary GS 1826-238 turned into a soft state on June 8, 2014. This source remained in the hard state since the discovery in 1988 (Cocchi et al, 2010, Ubertini et al. 1999, Barret et al. 1996, Tanaka 1989) including the recent five years of MAXI observation. However, on 8 June 2014, the MAXI/GSC hardness ratio (7-20keV / 2-7 keV) showed a rapid drop from ~ 0.4 (previous level) into 0.1, which meant a softening. The 2-10 keV X-ray flux accordingly increased from 50 mCrab (before May 2014) to 140 mCrab (15 June 2014) (Fig.1). 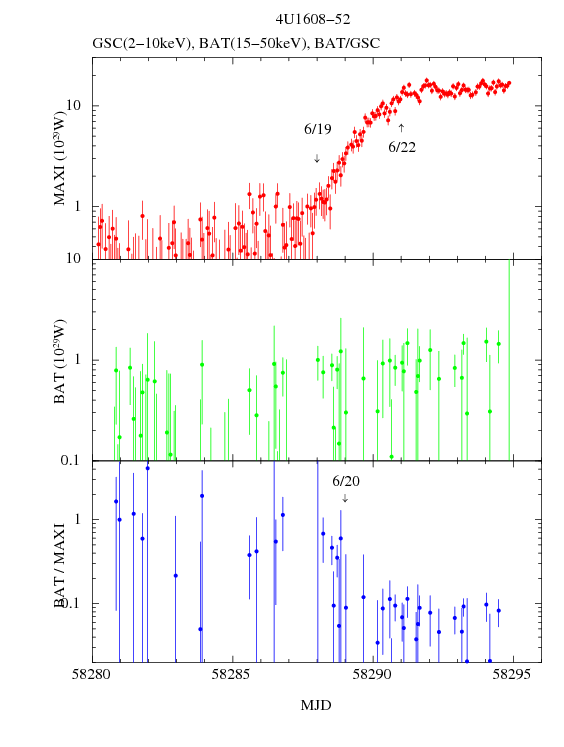 On the other hand, Swift/BAT light curve shows a decline in the hard X-ray band (15-50 keV) after 2014 June 8. The GSC spectra of the hard state and the soft state are shown in Fig.2. These results indicate that the source entered into a soft state for the first time. Fig.1. Light curves with MAXI/GSC and Swift/BAT. The MAXI flux started to increase and the BAT flux started to decrease from MJD 56816 (2014/06/08). The two jumping points in MAXI at 56793 and 56815 MJD are X-ray bursts. The BAT light curve is taken from http://swift.gsfc.nasa.gov/results/transients/Ginga1826-238/ . Fig.2. Spectra of the hard state (black, 56770- 56800 MJD) and the soft state (red, 56820 – 56827 MJD) of GS 1826-238 with MAXI/GSC. The fit model is wabs*(diskbb+compbb). Now the disk-blackbody is dominabt in the soft energy band. The GSC spectrum can be obtained through MAXI On-demand page http://maxi.riken.jp/mxondem/ . The extremely bright GRB 140219A has been detected by MAXI/GSC. The position of the source was not in the field of view of any of GSC cameras. The photons came through counter walls, shields, or collimator sheets. Part of the signals might be produced by the Compton-scattered electrons induced by the gamma-rays. The light curve of GRB 140219A observed by GSC_3 counter. The high resolution light curve around the peak is shown in the inset. The pulse period (about 7.6 s) and change rate of the pulse period (about -2.6 x 10-11 s/s) of the X-ray Binary Pulsar 4U1626-67 are obtained with MAXI/GSC data. The pulse period (red points in the figure, plotted in frequency) was obtained in each 60-day MAXI/GSC data from MJD 55110 up to 56249. The results were superposed with those with Fermi/GBM (black points). 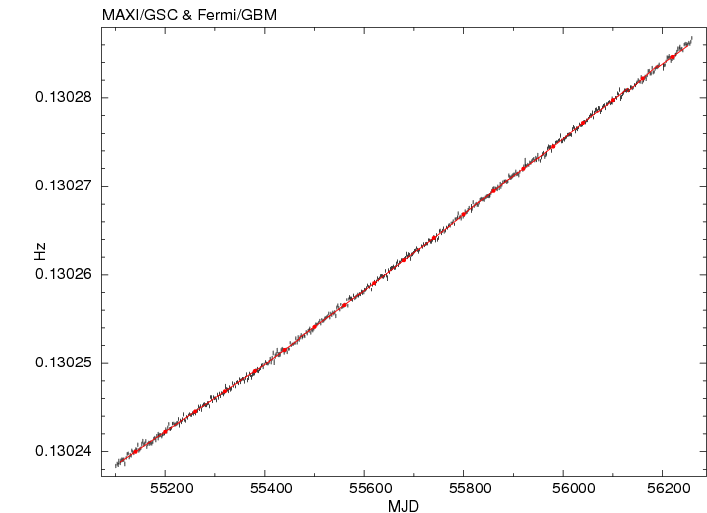 MAXI data are consistent with the Fermi/GBM data. Each red bar with the red point represents an average change-rate of the pulse period with MAXI in the 60 days. The pulse period is getting shorter and shorter (= spinning up) with alomost a constant change rate. The next figure shows residuals from a linear fit to the Fermi/GBM data. Red points and black points represent MAXI and Fermi/GBM data, respectively. The vertical axis is in frequency. MAXI data points have an error bar, but it is small enough as is sometimes included in the size of the red points. The data is V-shaped, and there is a break in the middle. We found that the flux after this point was brighter than that before. We interprete that amount of gas accreting to the neutron star increased at this point to cause an increase in the spin-up rate.